What if you could save an hour a day starting tomorrow? That’s 5 hours per week or more than a half-day off. Imagine closing up shop at 11 am every Friday without worrying about all the stuff that didn’t get done. Or, put another way… What if you could take all the “things to remember” off your mind and know they were taken care of 100%? Take all that off your mind and you open us space for creating, connecting and working on your business doing the things you most love to do. 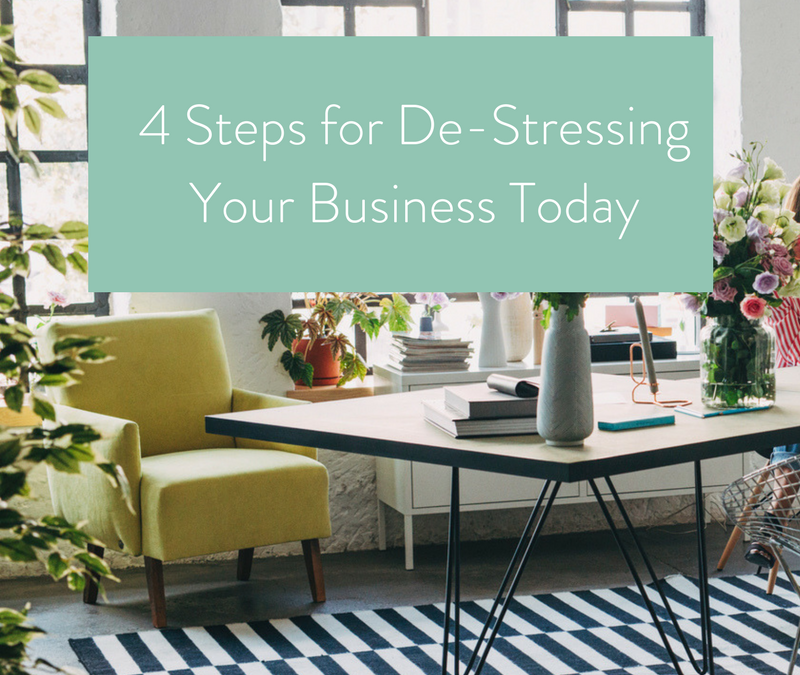 Here are our top four things you can do right now to de-stress yourself, your team and your business as a whole. If you’re still managing your team with email and Slack or Skype messages, stop it. Those things have their place but managing your tasks and projects is not one of them. Things get lost, messages are forgotten (or never received) and balls are dropped. Not to mention all the time you and your team spend sifting through your endless list of emails for that one piece of information you need. Sign up for a project management system today, and start putting all your projects, tasks, things to remembers, resources, and plans there instead. You’ll have one place to look for tasks that are still outstanding, and be able to tell at a glance what needs your immediate attention. We happen to love Teamwork but there are others too. If Teamwork doesn’t look like good fit for you check out Asana or Basecamp. The key here is to find the one that works for you and use it… consistently. Do you find yourself reinventing the wheel every time you have to record a podcast or upload a video to your blog? Or reminder your team of the specific way you like things done? Then, it’s time to get started on your operations manual. Take an extra 5 minutes and document the steps for the tasks you’re delegating (or are ready to delegate). Open your Project Management System (see, we’re already using item #1! ), go to the corresponding project, and write down the way you do it, the way you want it done and any updates you might want to make in the process. With that in place you can delegate with ease and know that all of the steps are covered. Or, if you’re jumping in to do it yourself, you’ll know you’re not going to miss any key steps. While it can feel cumbersome (Insert refrain: I can do it myself so much faster, easier, etc… I know how I want it to look…) taking the time to write it out will help you and your team long term. Think of the relief and open space you create when you’re not trying to remember the Featured Image size for your blog post, the right tags to use on Instagram, the lists and tags to include on your newsletter, etc. In the end, there will be fewer mistakes, and the work will get done faster and with more ease. Create a business organization chart. This is a critical step in building your business. Whether you’re getting ready to bring on your first team member or you have a full team having an org chart in place will help you see the vision for your support and it will help your team know who to ask for what and when. Yep, one chart can do all that… with ease. Rather than everyone coming to you with questions—or worse, asking the wrong person and getting the wrong answer—take the time to create an organization chart. Add it to your operations manual and make sure your team knows where it is and what it’s for. Now, rather than your Slack chat blowing up with questions all day long, you’ll be able to focus and have time for the tasks that only you, the business owner, can do. Bonus points: Set up your current org chart AND your dream or future org chart. Knowing where and how you want to grow your team as your business grows will help you make smart hiring decisions, bring on the right people, and make scaling your business much easier. Start looking at the tasks and projects on your plate. What goes together? What can you sit down for a block of time and just get done. Whether it’s blog posts for the month, social media, newsletters, launch planning, planning your next 90 days… Whatever it is get out your calendar, block off the time, keep the appointment with yourself and dive in. A lot of our clients get a ton out of batching their regular content. Do a month, a quarter, six months… Whatever feels best to you but just imagine the feeling of knowing your content creation is complete, that you do not have to focus on it every week. The time saved from the weekly procrastination alone is worth it! The energy and mind space opened up makes it a complete must do. Bonus points: While you’re at it go ahead and document your process (especially if this is something you can delegate now or later) AND for double bonus points go ahead and add the task to your project management system for your next batch. You can get started with all of these systems in an afternoon. The time they save you when you use them consistently is phenomenal. An hour a day is just the beginning, however you have to take action. You have to put in the work first, before you can earn the rewards, but the benefits are sweet. In the end, you’ll wonder how you ever managed before you did these four things to improve your business. Enter your name and email below and get notified when the Guide to Building Your Team is available! Enter your name and email below and get notified when the Guide to Taming Your Admin is available! Enter your name and email below and get notified when the Guide to Creating Your Ops Manual is available! Enter your name and email below and I’ll send you my pitch process, email template and tracking sheet and so you can get started today.